The Israeli and Palestinian presidents will plant an olive tree as a symbol of peace after an unprecedented prayer meeting with Pope Francis in the Vatican Gardens on Sunday amid high tensions in the Middle East. The Vatican said it hoped the initiative launched by Francis, which will include Christian, Jewish and Muslim prayers and music, would have an impact on public opinion but stressed it would be a purely spiritual event. Israeli President Shimon Peres and President Mahmoud Abbas will arrive separately to be greeted by Francis at the Vatican's St Martha Residence, where he lives. They will be joined by the Ecumenical Patriarch of Constantinople Bartholomew I, a spiritual leader of the Orthodox Christian world who is close to Francis. 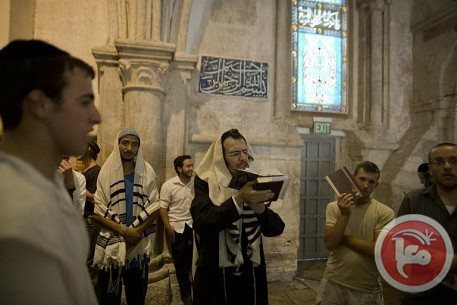 The ceremony will begin at 1700 GMT, the Vatican said on Friday, specifying that prayers will be delivered in the chronological order of the founding of world's three main monotheistic religions: first Judaism, then Christianity and Islam. The prayers from each of the three delegations will focus on three themes: "creation," "invocation for forgiveness," and "invocation for peace", the Vatican said. "This is a pause from politics," said Father Pierbattista Pizzaballa, who is organizing the event and heads up the Franciscan order in the Middle East. "The pope wanted to look beyond, upwards. Nobody is fooling themselves that peace will break out in the Holy Land, that this will bring peace closer. But this time to stop and breathe has been absent for some time," he said. "This will not be an inter-religious prayer. We are not holding a joint prayer, we are meeting to pray," he said. Pope Francis, on his last day of a 3-day pilgrimage to the Holy Land, called for allowing all believers free access to holy sites in Jerusalem, according to Agence France-Presse (AFP). “At the same time, there must also be a recognition of the right of the Palestinian people to a sovereign homeland and their right to live with dignity and with freedom of movement. The 'Two State Solution' must become reality and not remain merely a dream,” he urged those gathered at the Ben Gourion Airport in Tel Aviv on May 25. 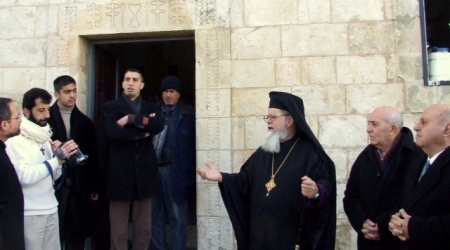 An arsonist set fire to a Catholic church Monday at a contested site in Jerusalem during a visit by Pope Francis, the spokesman for the Abbey of the Dormition told AFP. 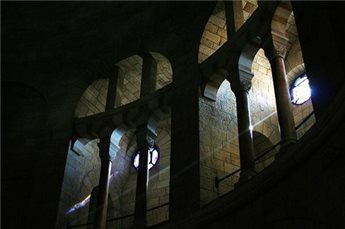 "Someone entered the church, went down to the crypt, picked up a book used by pilgrims and took it to the small room near the organ and set it on fire, burning wooden crosses," Brother Nikodemus Schnabel said, just after Francis celebrated mass next door at the Upper Room in Mount Zion. 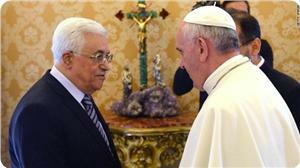 The Pope’s speech to Palestinian leaders in Bethlehem early in the day expressed the same call for a peaceful solution. Pope Francis reiterated his invitation to prayer in the Vatican, which he had also offered to Palestinian President Mahmoud Abbas. 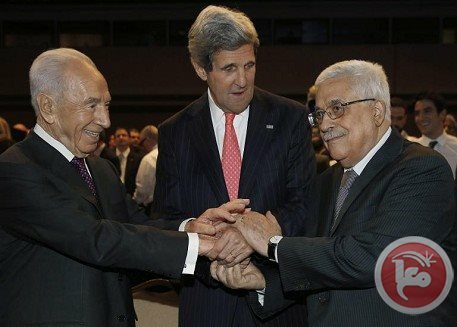 Both Abbas and Peres have accepted and will join him sometime in June. 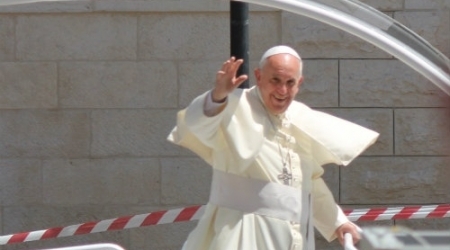 The Pontiff noted improving relations between the Vatican and the State of Israel, expressing his prayerful best wishes to “all the people of Israel” that “their aspirations of peace and prosperity will achieve fulfillment. “The path of dialogue, reconciliation and peace must constantly be taken up anew, courageously and tirelessly. There is simply no other way,” he stressed. Before his speech, the Holy Father had been welcomed by both Israeli President Peres and Prime Minister Benjamin Netanyahu. Netanyahu spoke of his gratitude to Pope Francis for his closeness to the Jewish people, particularly visible in his co-authorship of a book with Argentinian Rabbi Abraham Skorka. The Prime Minister assured the Pontiff of Israel’s desire for peace, describing the state as an “island of tolerance” where they are committed to freedom of religion. The pontiff closed his remarks by offering “a warm and fraternal greeting” to the local bishops and Christian faithful – assuring them that they are in his prayers. “I encourage them to persevere in their quiet witness of faith and hope in the service of reconciliation and forgiveness, following the teaching and example of the Lord Jesus, who gave his life to bring about peace between God and man, and between brothers,” he said. Mahmoud Abbas, the Palestinian Authority president, is to visit the Vatican on 6 June at the invitation of Pope Francis. 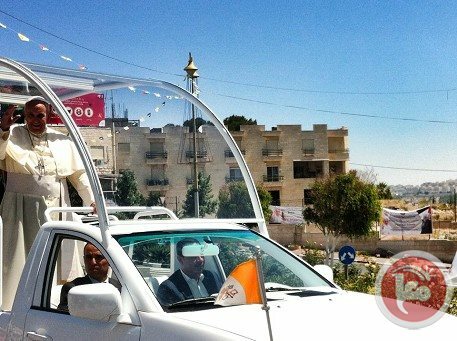 The official Palestinian news agency WAFA quoted Nabil Abu Rudaina, the PA presidency spokesman, on Sunday night as saying that Abbas welcomed the invitation by Pope Francis during their meeting in Bethlehem earlier Sunday. Abu Rudaina said that Abbas welcomed the invitation in view of the Pope’s keenness on supporting peace and peace prospects in the Middle East. The Israeli radio earlier said that the Pope addressed a similar invitation to Israeli president Shimon Peres to visit the Vatican.